A fun and playful way for your students to learn about the great composers, perfect for any studio or classroom! 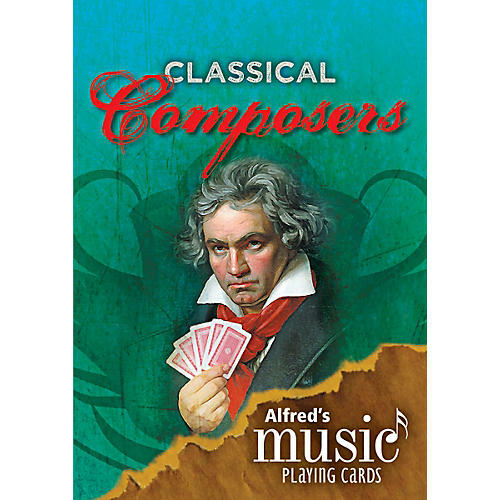 Alfred's Music Playing Cards: Classical Composers are an exciting and innovative resource to help students become familiar with the great composers. These are real playing cards divided into four suits, each representing a different compositional era of music: Renaissance, Baroque, Classical, and Romantic. Each suit contains 13 composer cards with the composer's likeness, nationality, birth and death dates, brief facts about his or her musical life, and important compositions. Four jokers are included as well, each containing a brief outline of the corresponding musical style period. The cards can be used to play Crazy 8s, Gin Rummy, Matching, Go Fish-virtually any card game using a 52-card deck!